In April, the U.S. Government signs the Fort Laramie Treaty, giving ownership of the Black Hills to the Lakota Sioux nation. During the summer of 1874, General George Armstrong Custer leads an expedition to the Black Hills with the stated goal of finding a suitable location for a fort. Two prospectors accompany the expedition and on August 2, they discover gold near present day Custer, South Dakota. Once word was out that there is gold in the region, prospectors come in droves to the southern hills. That all changed when in the fall of 1875, a rich gold deposit is discovered in the northern Black Hills. This caused a stampede to what is now known as Deadwood Gulch. Gold is found in the northern Black Hills. Miners stake their claims and set up camp in a gulch full of dead trees and the town of Deadwood is born. Thousands of miners make their way to the area in search of their own fortune. In April 1876, the city of Deadwood is officially laid out. On April 9, 1876, miners Fred and Moses Manuel strike gold in a rock outcropping near the present day town of Lead. Dance halls, gambling establishments, saloons and brothels are constructed along both sides of lower Main Street in May. This area becomes known as the “Bad Lands” of Deadwood. In June 8, 1876, the Black Hills Pioneer publishes its first newspaper in Deadwood. Deadwood residents celebrate the United States’ centennial, paying no mind to the fact that the Dakota Territory would not become part of the United States until 1889. Colorado Charlie Utter and his brother Steve organize a wagon train from George, Colorado, to the gold fields of Deadwood and the Black Hills. The wagons pass through Cheyenne, Wyoming picking up over 100 passengers. Among them are Wild Bill Hickok, Calamity Jane, Madam Mustache, Dirty Em and “working” girls. The wagon train arrived around July 12, 1876. Wild Bill Hickok is shot from behind while playing poker at Nutall and Mann’s Saloon No. 10. The man who pulled the trigger, Jack McCall, is acquitted of the murder the following day by a miner’s court with no jurisdiction. McCall flees Deadwood but is eventually captured, convicted and hanged by the legal authorities of Dakota Territory. Wild Bill Hickok is laid to rest in a burial plot paid for by Colorado Charlie Utter. An epitaph carved into a wooden board reads: Wild Bill, J. B. Hickok killed by the assassin Jack McCall in Deadwood, Black Hills, August 2, 1876. Pard, we will meet again in the happy hunting ground to part no more. Goodbye, Colorado Charlie, C. H. Utter. Seth Bullock and business partner, Solomon “Sol” Star, arrive in Deadwood and open Star and Bullock Hardware on August 4. The hardware store stocks mining equipment, lumber and other items needed by the boomtown. Preacher Henry Weston Smith is murdered on his way to deliver a sermon in Crook City. The death of Deadwood’s earliest minister is generally blamed on Native Americans in the area. E.B. Farnum, a local businessman, is elected the town’s first mayor. In October, Farnum and town commissioners draw up the first city charter establishing the town limits and setting the mayor’s salary at $100 per year. 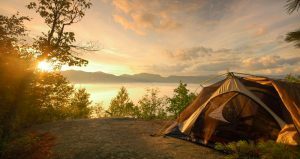 Population estimates for the summer vary widely, with anywhere between 5,100 to 10,000 people prospecting for gold in the area. The first telegraph lines reach Deadwood on December 1. Lawrence County is organized and Territorial Governor Pennington appoints Seth Bullock as Deadwood’s first sheriff. Al Swearingen opens the Gem Variety Theater. The Gem was one of Deadwood’s most notorious houses of bawdy entertainment. Mining mogul George Hearst buys the Manuel brothers’ claim for $70,000 and establishes the Homestake Mining Company in June. The Homestake Gold Mine was destined to be the deepest, longest-operating and most profitable gold mine in the Western Hemisphere. Pioneer businessman W.E. Adams and his brother James establish a grocery store on Main Street. Adams would become one of Deadwood’s most successful businessmen and served as Deadwood mayor for six terms. Federal Judge Granville Bennett declares the appointments of Lawrence County officials illegal and requires elections to be held. In the hotly contested election, Sheriff Seth Bullock loses to rival John Manning. Chinatown is developed in lower Deadwood. Traveling salesman Harris Franklin establishes a liquor business on Main Street. He eventually amasses a fortune through banking, ranching and mining ventures. He and his family will build the Franklin Hotel on upper Main Street. The Black Hills Pioneer installs the first telephone lines in Deadwood on March 9, just one year after President Hayes had telephone service at the White House. Successful businessman Fee Lee Wong arrives and establishes the Wing Tsue Emporium. His wife and family later join him in Deadwood. Deadwood City government attempts to control the use of opium by taxing the drug and licensing the opium dens. On September 26, a fire rages through Deadwood, destroying over 300 buildings and leaving 2,000 people homeless. The fire starts in a bakery on Sherman Street and quickly spreads through the boomtown. Citizens rebuild the town in six months, replacing most of the wooden buildings with brick and stone structures. 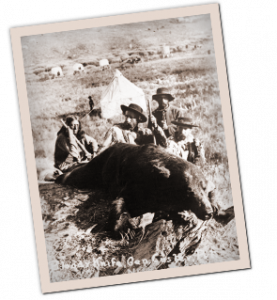 Colorado Charlie Utter oversees the moving of Wild Bill’s remains to a new burial site at Mt. Moriah Cemetery. People left homeless by the fire of 1879 leave town and don’t come back. 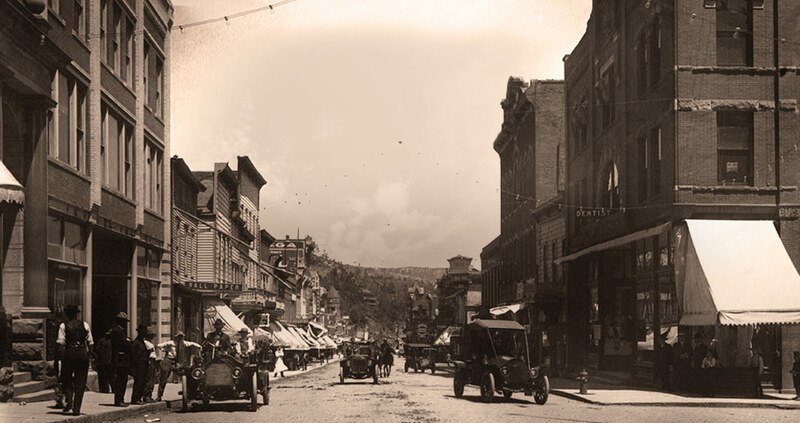 The 1880 census places Deadwood’s population at 3,777 people. In mid-May, a big snow melt followed by heavy rains leads to a disastrous flood that washes away or badly damages many businesses in Deadwood. The first electric lights in Deadwood are turned on in December. Construction begins on the Deadwood Central Railway, a narrow-gauge line, which connects the town of Deadwood to the gold mines in the town of Lead. South Dakota legislators pass the state’s first prohibition law to make the selling of alcohol illegal. The law goes into effect on May 1, 1889. Dakota Territory is split into two states, North and South Dakota. Both are granted statehood on November 2. The 1890 census lists the population of Deadwood at 2,366 people. U.S. 7th Cavalry surround an encampment of Lakota Indians near Wounded Knee Creek with the goal of disarming and escorting them to a reservation. After a deaf tribesman fails to hear the order to give up his rifle, the Army opens fire killing 146 men, women and children. The massacre effectively ends the Indian wars. Hard rock mining booms during the decade as new technologies are developed to extract gold from low-grade ore. The Fremont, Elkhorn, and Missouri Valley Railroad is the first passenger train to arrive in Deadwood. Alice Ivers Duffield, later known as Poker Alice Tubbs, arrives in Deadwood. Construction of Harris and Anna Franklin’s lavish Victorian mansion begins on June 9. Deadwood is again devastated by a massive fire that destroys its Main Street business district. The fire reportedly starts in a boarding house. After a fire destroys his hardware store, Seth Bullock begins building a sandstone hotel. The three-story, 64-room Bullock Hotel opens in 1896. The hotel remains a fixture on Historic Deadwood’s Main Street, and some visitors report that Bullock’s ghost roams the hallways. Governor Arthur Mellette adds a provision to the state’s constitution making gambling and prostitution illegal. The Gem Theatre, undergoing renovations, catches fire for the third time. When firefighters arrive at the scene they discover that someone has stolen the hydrant wrenches. The Gem burns to the ground for the last time. Al Swearingen leaves Deadwood. Deadwood’s population is estimated to be 3,498 people. Deadwood businessmen build the Black Hills Mineral Palace to display the abundant geological specimens found in the northern Black Hills. An electric trolley line that runs between Deadwood and Lead is established. On June 4, the four-story Franklin Hotel with 80 rooms and many amenities opens. It was named for Harris Franklin who was one of the principal supporters of the project. Martha “Calamity Jane” Canary returns to Deadwood. Soon after her arrival, she dies in the nearby mining town of Terry. Seizing the opportunity to capitalize on her fame, Deadwood businessmen bury her next to Wild Bill at Mount Moriah Cemetery. Wind Cave, located in the southern Black Hills, becomes the nation’s seventh national park. Today, Wind Cave National Park is considered one of the longest caves in the world. Former Gem Theatre owner Al Swearingen is found dead on November 15 in a Denver, Colorado rail yard. He died of blunt trauma to the head. Seth Bullock is appointed by President Theodore Roosevelt as U.S. Marshal for South Dakota. Bullock holds the position for nine years and becomes good friends with Roosevelt. The Carnegie Free Library opens in Deadwood. The Homestake Slime Plant is constructed in Deadwood. Using a process developed by C. W. Merrill, the plant is built to extract gold from slime, a by-product of crushed ore that is suspended in water. Deadwood’s streets are paved with bricks. The Federal Courthouse and Post Office open to public on May 1. President Theodore Roosevelt declares Jewel Cave a National Monument providing for its preservation. Jewel Cave is currently one of the world’s longest caves. Construction of the Lawrence County Courthouse in Deadwood is completed. C.J. Faehndrich opens Deadwood’s first automobile garage and showroom at 630 Main Street. In 1910, Deadwood’s population is estimated to be 3,653 people and Lawrence County begins turning wagon roads into improved highways. President William Howard Taft vists Deadwood and Lead. The Deadwood Auditorium opens to the public. Over the years, the building will host automobile and home shows, retail fairs, concerts and dances. The building was converted into a recreation center during the 1950s. President Theodore Roosevelt dies. Upon the news of his death, Seth Bullock and the Society of Black Hills Pioneers build and dedicate a monument to the late president. It is the first monument in the country to be dedicated to Roosevelt and is known as the Friendship Tower. Seth Bullock dies at the age of 70 on September 23. The United States Congress passes the Prohibition Act, which bans the sale and distribution of alcohol. Although Prohibition shuts down Deadwood’s saloons, drinking and gambling simply moves behind closed doors. W.E. and Alice Adams purchase the elegant Victorian mansion located at 22 Van Buren Street from Nathan and Ada Franklin. Deadwood’s population falls to 2,403 residents. On August 15, the first Days of ‘76 celebration is held in Deadwood. The celebration is based on Buffalo Bills’ Wild West Show. In addition to including two days of parades, the current Days of ’76 celebration now features an award-winning PRCA rodeo. Nell Perrigoue and Mary Ann Wood write The Trial of Jack McCall, a re-enactment production based on the miner’s court trial of Wild Bill Hickok’s assassin. You can see this production every night April until October in Historic Deadwood. Deadwood builds a new centralized school on Main Street and eliminates the neighborhood schools. Mount Rushmore National Memorial is officially dedicated and blasting begins on the 60-foot faces of Presidents George Washington, Thomas Jefferson, Theodore Roosevelt and Abraham Lincoln. President Calvin Coolidge, vacationing in the Black Hills, participates in Deadwood’s Days of ’76 celebration after dedicating Mount Rushmore. South Dakota Governor Bulow pardons Poker Alice Tubbs after she was convicted on a bootlegging charge. John E. Perrett, known as Potato Creek Johnny, makes history when he reportedly finds one of the largest gold nuggets in the Black Hills. The 7-3/4 troy ounce nugget is purchased by W.E. Adams for $250 and put on display at the Adams Museum. The Deadwood Business Men’s Club reorganizes as the Deadwood Chamber of Commerce. Badlands National Monument is established in southwestern South Dakota. The designation was changed to Badlands National Park in 1978 after the National Parks Service enters into an agreement with the Oglala Sioux Tribe to protect an additional 122,000 acres. The Adams Memorial Hall Museum opens, becoming the Black Hills’ oldest history museum. Poker Alice Tubbs dies and Deadwood’s population is 2,559. The Prohibition Act is repealed and gambling once again flourishes in the town of Deadwood. Merchant, mayor and philanthropist W.E. Adams dies. The Federal Gold Reserve Act is passed, setting the price of gold at $35 an ounce. While the rest of the country is in a severe depression, the Lead-Deadwood areas prosper. Reptile Gardens opens in Rapid City. A group of ski enthusiasts organize the Bald Mountain Ski Club, and install a rope tow up Stewart Slope. After returning from serving in World War II, Ed Keene opens what is today know as the Terry Peak Ski Area. The now famous Old Style Saloon No. 10 moves to its current Main Street location. Motorcycle enthusiasts begin the Sturgis Rally. The Sturgis Motorcycle Classic now attracts over 350,000 riders annually. Deadwood’s population increases to 4,100. Mount Rushmore National Memorial is declared complete a few months after the death of sculptor Gutzon Borglum. Today, Mount Rushmore draws over three-million visitors a year from all around the world. Country is At War. No More Gold. The United States is deep into WWII in both the European and Pacific Theater. The War Production Board labels gold mining as a non-essential industry and orders the Homestake Gold Mine shut down. Ellsworth Air Force Base is established near Rapid City. Homestake begins making hand grenades in support of the war effort. Law enforcement officials raid Deadwood gambling establishments with the goal of shutting them down for good. The raid only served to move them underground. Governor George Mickelson names Tootsie, a coyote owned by Deadwood businessman Fred Borsch, the state animal. Law enforcement officials raid Deadwood’s three brothels in an attempt to shut them down. By 1951, the brothels were back in business. The SD State’s attorney once again attempts to shut down the brothels. Brothel attorney Roswell Bottum succeeds in getting the madams acquitted. Another raid occurs in 1959 but fails to close down the houses. Crazy Horse Memorial sculptor Korczak Ziolkowski unveils the bust he carved of Wild Bill Hickok. The bust is located near the intersection of Sherman and Deadwood Streets. A fire starts one mile west of Deadwood and quickly burns out of control. Residents in Deadwood are evacuated. The fire was brought under the following day but not before a total of 4,501 acres had burned. The entire town of Deadwood is declared a National Historic Landmark. It is the first time an entire community receives this recognition. Heavy spring snows and rainstorms cause significant flooding in both Deadwood and Spearfish. An intense rainstorm causes the Canyon Lake Dam to break in Rapid City. The flood killed 235 people and destroyed an estimated $100 million in property. Federal and state authorities shut down the last four remaining Deadwood brothels. The town throws a parade just like the did the day Charlie Utter’s Wagon Train brought the working girls to Deadwood in 1876. A fire destroys the building that housed Pam’s Purple Door, one of Deadwood’s last brothels. Deadwood’s Historic Preservation Commission is established to oversee the restoration of the town. A group of Deadwood visionaries creates the You Bet Committee to help pass limited stakes gaming in Deadwood to fund restoration. A fire destroys the historic Syndicate Block along Lee Street. The Deadwood You Bet committee uses film footage of the devastating fire to convince South Dakota voters of the need for legalized gaming as a means to restore the town. Limited-stakes gaming in Deadwood is passed by a statewide vote. Legalized gaming kicks off in Deadwood on November 1. A portion of tax revenue from gaming is dedicated to the restoration of the historic community. The Deadwood Historic Preservation Commission purchases the Adams House, operating it as a Bed & Breakfast. The Adams House’s heating system fails and the City stops operating the property as a Bed & Breakfast. The 109-mile George S. Mickelson Trail is completed—connecting the northern Black Hills to the southern tip. The trail, with trailheads in Deadwood, contains more than 100 converted railroad bridges and four rock tunnels. The Days of ’76 Rodeo is named by the PRCA as the Best Small Rodeo of the Year. The Days of ’76 Rodeo is once again named by the PRCA as the Best Small Rodeo of the Year. After a $1.5 million restoration, the Historic Adams House opens to the public as a museum. Over 14,000 visitors tour the home annually. On November 7th, South Dakota voters pass a bet limit hike from $5 to $100 in Deadwood’s gaming halls. The $100 bet limit draws more visitors. Remnants of part of the old Chinatown district are discovered as construction begins on a new parking garage. The South Dakota State Archaeological Research Center is hired to do the excavation work. The Days of ’76 Rodeo is once again named the PRCA’s Best Small Rodeo of the Year. Barrick Gold Corporation officially closes down the Homestake Gold Mine—126 years after gold was first discovered. Another fire threatens to destroy the town of Deadwood. Residents are evacuated from Deadwood, Lead and outlying areas in late June. The fire is contained on July 1 and residents return to their homes. Deadwood throws a party and parade for the firefighters. HBO® premieres its critically acclaimed series Deadwood, drawing the biggest audience for a new series in the network’s history. The television show, based on the early days of Deadwood, is a huge hit but only runs for three seasons. The South Dakota Legislature creates the South Dakota Science and Technology Authority to help change the Homestake Gold Mine into a deep underground laboratory. The Days of ’76 Rodeo is named the Best Midsize Rodeo of the Year. Country music stars, Big & Rich, perform a live concert on Deadwood’s Historic Main Street during Wild Bill Days. The free event draws over 50,000 people. The Days of ’76 Rodeo is once again named the Best Midsize Rodeo of the Year. The Barrick Gold Corporation donates the Homestake Gold Mine to the state of South Dakota. A $70 million donation from billionaire T. Denny Sanford and a $40 million commitment from the state of South Dakota prepares the way for the development of a deep underground lab. The city of Deadwood purchases guns belonging to Wild Bill Hickok and Charlie Utter at a California auction. The collection includes an 1860 Colt conversion pistol owned by Hickok. You can see it on display at the Adams Museum. Deadwood celebrates the 20th anniversary of limited-stakes casino gaming. The Lodge at Deadwood opens and houses a 1,700-seat convention hall. The population of Deadwood is 1,270 and True West magazine names the Adams Museum the #2 Top 10 Western Museums. The National Science Board decides not to fund further design of a Deep Underground Science and Engineering Laboratory in the former Homestake Mine. However, the support of the state and philanthropist T. Denny Sanford experiments begin on the 4850 level. South Dakota voters pass a statewide smoking ban that impacts Deadwood casinos and bars. The Days of ’76 Rodeo is once again named the Midsize Rodeo of the Year. The Days of ’76 Rodeo is once again named the Best Midsize Rodeo of the Year. The Days of ’76 committee is inducted into the Pro Rodeo Hall of Fame. The Homestake Adams Research and Cultural Center officially opens in Deadwood. The extensive collection includes historic photographs, maps, gold exploration records and more. The new Days of ’76 Museum opens in Deadwood. The 32,000-square-foot houses an impressive display of carriages, firearms, and American Indian artifacts. Bet limits in Deadwood jump from $100 to $1,000 on July 1, 2012. The city of Deadwood auctions off a replica of Potato Creek Johnny’s nugget to raise money to build a secure display that will house the real gold nugget. The Black Hills is hit by an early October blizzard that kills hundreds of head of cattle and four people. Nearly 50 inches of snow fell in Deadwood and 40,000 homes were without power for days. True West magazine names Historic Deadwood the Best Town for Historical Entertainment. South Dakota voters pass the Amendment Q measure, which allows the state legislature to authorize new games—roulette, craps and keno—in Deadwood. Revenue from the games will continue to go toward historic restoration and preservation of Deadwood. In July of 2014, the real 7.346 troy ounce gold nugget found by Potato Creek Johnny is placed on display at the Adams Museum. The nugget is in a shatterproof, highly secured case paid for by the proceeds of auctioning off a replica of the nugget. The population of Deadwood is 1,261 and Days of ’76 Rodeo is once again named the Best Midsize Rodeo of the Year. True West magazine names Deadwood the Best Old West Gunfighter Town. Visitors can begin to play roulette, keno and craps starting July 1. The Days of ’76 Rodeo is once again named the Best Midsize Rodeo of the Year for the 11th consecutive year. The hit ABC show “The Bachelor” films a two-hour episode in Deadwood. Iowa farmer, Chris Soules takes the women on dates around Deadwood, including to a special Big & Rich concert at the Deadwood Mountain Grand. On Jul 27, 2016, Chief David Beautiful Bald Eagle, who led the Days of ’76 parade on horseback for decades, dies at the age of 97. For the 12th year in a row the Days of ’76 Rodeo is awarded the PRCA’s Best Midsize Rodeo of the Year. Rumors begin to swirl that HBO is developing a movie of its popular series Deadwood, 10 years after the series ended. True West magazine names Historic Deadwood the Top True Western Town, Best Town for Historic Entertainment and Best Place to Live Like an Old West Cowboy. The city of Deadwood opens its new visitor center on lower Main Street. The building, situated along a mountain creek, offers interactive historical exhibits, meeting spaces and easy access to nearby hiking and biking trails.